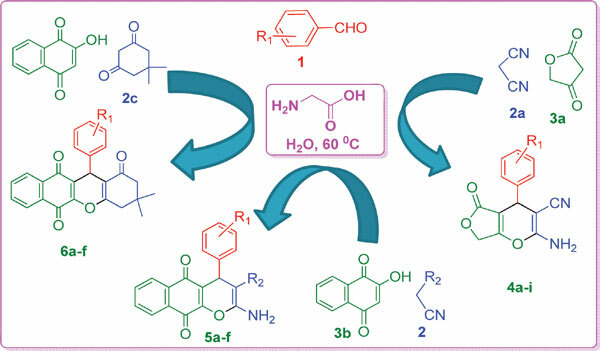 Introduction: 4H-furo[3,4-b]pyran, 4H-benzo[g]chromene and1H-benzo[b]xanthene derivatives have been efficiently synthesized in water using glycine as organocatalyst. Methods and Results: The key aspects of the present method are (1) The use glycine as organcatalyst which is metal free and in expensive (2) The synthesis was performed in water which is an ecofriendly solvent. Conclusion: Our reported protocol has several advantages like environmentally benign reaction conditions, operational simplicity, high atom economy, cost effectiveness and excellent yield. 1H- benzo[b]xanthenes, 4H-benzo[g]chromene, 4H-furo[3, 4-b]pyrans, glycine, organocatalyst.